This was my first Ironman, so what follows is only representative of my experiences as someone new to the event, and might be obvious to the more seasoned Ironpeople out there. 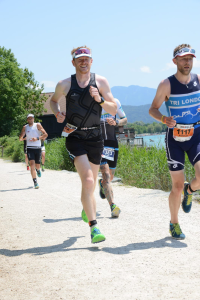 It’s mostly practicalities and a race review as a newbie, for people interested in racing Ironman distances, rather than an extensive trip on the emotional roller-coaster – I leave that to more capable writers than me! One line review: A beautiful fast course, well supported, in a great location. Highly recommended! 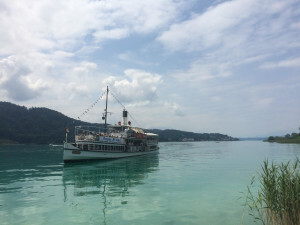 Accommodation: The area is really well set up for tourists, with small villages surrounding the Lake, we stayed in a guesthouse apartment about a ten minute drive from Klagenfurt. Many hotels in town, if that’s more your thing. Lovely to stay around for a few days after the race – swim in the lake (or Lakes Bled/Bohinj just across the border in Slovenia). Run: 2x21km almost totally flat laps of Lakefront/town, each lap 2x~5km out and back, so you visit the event centre effectively five times, largely shaded. Organisationally, the whole thing felt fine, although being new to the “clean transition” of Ironman meant that I had to check, recheck that I had everything in the “bike bag” and “run bag” before the race. My advice? MAKE YOURSELF A CHECKLIST, so you aren’t worrying about the contents of the bags, if it’s been checked off, it’s there. Don’t forget the suncream though, a necessity if you have a fair complexion like me…It’s a pretty well thought out process, changing bags and handing them over to the many volunteers, there is even a dedicated screened off area where you can fully strip off post bike (like I did!) so no one’s sensibilities are at risk of being offended whilst you get run-ready. IM Austria also provide a “special needs” bag, if you want to get stuff mid-bike or mid-run. I had a special needs bike bag which I threw a tuna sandwich in, as well as a few top up gels, in case I was feeling in need at the time, mid-way through the bike. Parking was OK, we parked at “minimundus” about 5:40am and there was plenty of space at that point. Headed to transition: make sure tyres are fully inflated, attach water bottle(s) to your bike (use cheap ones, as you will probably throw these away! ), get and fill your special needs bags if you haven’t done this the day before. You can then head over to the swim start (a fifteen minute walk back to the lake shore). IM Austria has a rolling start, so it’s a time trial. If you actually want to “race” someone, you both have to start at the same time! There are self-seeded pens, based on your estimated time. I put myself in the 1hr-1hr10 pen, rather than the sub 1hr pen, although in hindsight I was overtaking people throughout the whole swim so perhaps I should have gone in the quicker pen. Started with my mate Ali from TriLondon, which was great – we even managed to do a bit of the run together, we were so evenly paced. The lake was warm and there was a small chance pre-race that wetsuits would not be allowed. Thankfully we were all good as the water was a couple of degrees below the 23 degree limit (so they said…). The lake itself is turquoise blue, with actually not-that-good visibility, so it’s like swimming in a light blue cloud (good for me, I don’t like looking down into dark scary depths). The rolling start meant that I wasn’t fighting for space, and had an easy time in the water. The course is a loop out into the lake, and on the turn back, you end up looking directly into the rising sun, so it’s a good idea if you can to have a swim (or hire a pedalo for a more ‘touristy’ vibe) the day before to work out what you’ll be sighting, I chose the red-roofed building. The last km of the course is up the Lend Canal, which is about (I’m guessing) 8-10m wide, so it’ll feel a little busier for the last stretch. 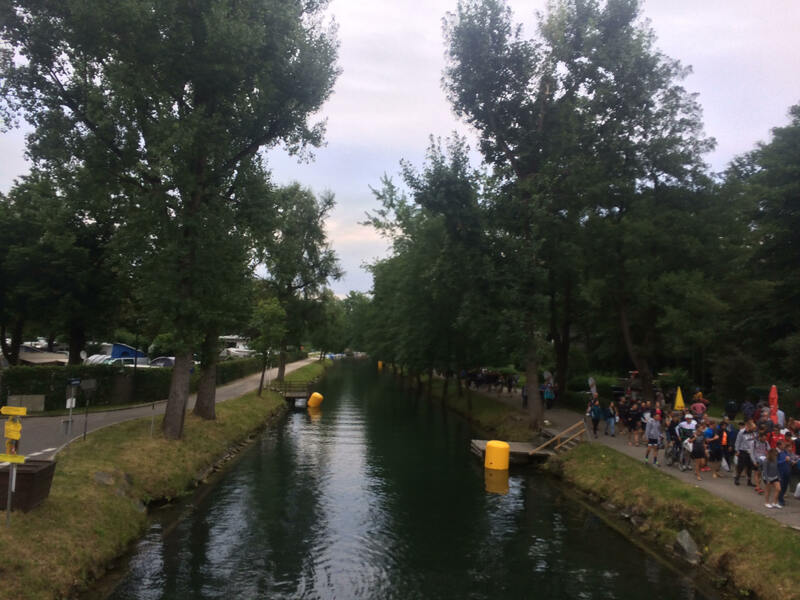 On the plus side, the canal flows out of the lake, so you’re swimming with the current (and the extra wash created by the hundreds of swimmers) so it’s fast! Best to swim down the middle if you don’t like grabbing bits of weed. 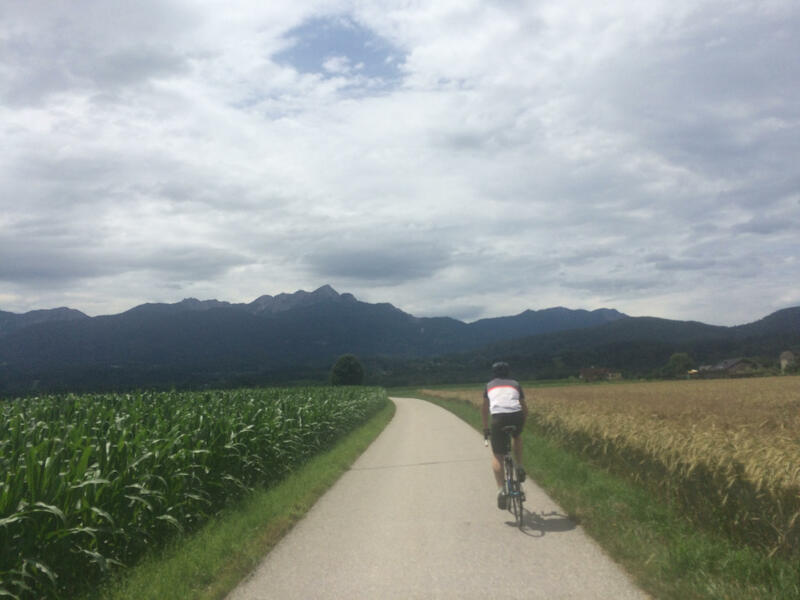 Where to start with the bike course…? I mean… Woosh! The roads were so smooth, the bends were so wide, the descents were so long. It was absolutely brilliant. You literally don’t need brakes for this course (apart from to get back into transition). The first stretch away from the town we had a following wind, and I was going about 40km/hr for the first 20-30km, which is just mental. There are a few small climbs, and I was feeling so good I just couldn’t resist easing past a few people on their lovely, expensive TT bikes! There are two main climbs (which you’ll do twice), each with great crowds of people. After the second, bigger climb (really nothing to fear), there’s a 20km descent back to the start of lap 2. I only had a 50 tooth front ring on my bike (error); you can really power through this section with a bigger gear. I was pretty uncomfortable for the second lap, so I’d encourage people going for a full distance to really practice that aero position as much as you can and make sure everything’s adjusted right. Aid stations were so frequent, and giving out bottles that fit in cages, so I don’t think it’s worth lugging around extra weight – my tactic at each one was to get rid of any empties, grab an ISO (the volunteers will be shouting “EESO” at you by the way), then grab another water (which I drank a load of) and then discarded in the “litter zone” – I only ever had one bottle on the bike, and the longest time between stations was half an hour. I was happy predominantly drinking the energy drink, but that might be just me. At the end of the first lap, you can get your “special needs” bag, although I’m still not sure how that was supposed to work. I tried riding along with it for a few hundred metres, before stopping to get my stuff out; the bag was massive and unwieldy (hardly aero to say the least!). I didn’t end up eating the sandwich in the end, which may or may not have been the right decision. As it was my Jelly Baby refuel got me through. Drafting is against the rules, but for the first lap (and to a lesser degree on the second – people spread out more), I saw a lot of it. I think basically, if you’re not within 30cm of the guy or girl in front when the technical race controllers whizz by on the motorbike, you don’t need to worry about the natural bunching which happens. I was occasionally a bit dismayed to get overtaken by a 6-or-so man chain gang on the long descents though. Apparently you will also be DQ’ed for getting “caught short”, let’s say, away from the aid station loos. Again, I saw a fair bit of it, and saw a few people getting clocked by the technical controllers, without any punishment. On balance, I probably still wouldn’t do it, as it’s a long way to travel, and a lot of effort, to not get a finish time. Transition 2 – a bit more space. Good. The course is flat, and takes you twice round and two out and back loops, the first along the lakeshore, and the second along the canal into the town centre. I really appreciated the lap being two out-and backs of 10km each, as it meant each section was effectively only 5km – so just a parkrun (x8!)!. There’s not much to say about it really – it’s pleasant, straight (apart from the annoying section around the event centre where they’ve basically made up and extra km to get the full distance! ), and all on good sealed paths or roads. Just keep going! There are aid stations with ice water and sponges to cool you down, as well as water/ISO (“eeeso”!)/coke. 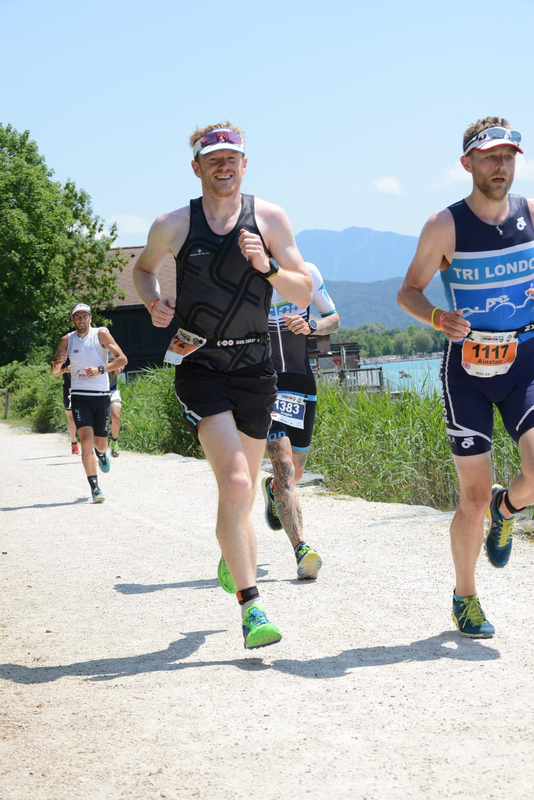 Anticipate chafing if you’re going to be using the sponges or dousing yourself in water (you will) – go long on the application of that Bodyglide/Vaseline, you definitely want to put some in the run bag! Don’t expect to feel good. You might. Your legs definitely won’t. Find someone to congratulate and give them a hug. You’ve bloody done it! I almost had a bit of a cry when I finished, as the waves of adrenaline dissipated through and I didn’t know what to do with myself. Apparently my lips went blue for a bit, as I was drenched and stopped to wait for my brother to finish, about 20 minutes later, so I got quite cold. This was sorted by the hot showers, which were very very welcome. Getting un-dressed/dressed and bending down pick stuff off the floor will be accompanied by lots of swearing – you’ve really got a license to go to town here, so enjoy a good bit of turning the air blue! Make sure to take advantage of the massage (post shower!) on offer too. I found it really hard to eat, as my heart rate was still really elevated (as if I’d drunk an absolute shedload of coffee), even an hour after finishing, but the goulash soup eventually went down well. We were supposedly going to hook up with Ali for a post-race beer, but we couldn’t face it. Straight home for dinner and a lie down! 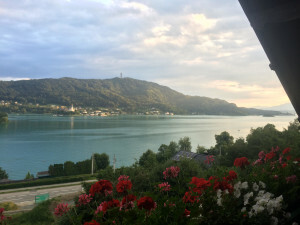 I highly recommended this race if you are looking for a European endurance getaway next year (2020 now…), be quick, it sells out lightening fast ! Go for a relaxing post-race boat trip!